This last Monday, I gave a presentation at my YSA Family Home Evening on evidence for the Book of Mormon. Though I have spoken to my friends in the ward several times about my work with Book of Mormon Central, I took the opportunity to introduce Book of Mormon Central to them as resource, and specifically explained what KnoWhys are, since I was going to be drawing extensively from the KnoWhys for my presentation. When I was child, I spake as child, I understood as a child, I thought as a child: but when I became a man, I put away childish things. My reason for using this passage was because in my experience, many who experience a faith crisis over archaeology and the Book of Mormon never developed mature ways of reading the text. While they don’t do this consciously, they tend to read the book like a fairytale or fantasy novel. Now there is nothing wrong with fairytales and fantasy novels, except when they shape your perceptions of history and expectations of archaeology. When you believe the Book of Mormon is history but read it like fantasy, you set yourself up for a faith crisis. There is a lot in Wineburg’s discussion of these issues that could be highlighted, but the sake of brevity I will simply focus on Wineburg’s point that “context” for historical data or documents, is not something which is self-evident, nor even self-existent. To contextualize is “to engage in an active process of connecting things a pattern” (Wineburg, Historical Thinking, 21). The historian, or anyone engaging with the material, creates the context. Our natural habit with the Book of Mormon and other historical documents is to import context from our own world into what we are reading. Hence, the Book of Mormon becomes more of a fanstasy novel as we visualize it like Lord of the Rings or other epic Hollywood depictions, even those of the actual past (which, for the record, are rarely accurate). This usually subconscious way of interpreting the text then affects what we expect for “archaeological evidence” and such. It is time to put away such childish things. We need to change the way we think, understand, and talk about the Book of Mormon. Instead, we need to practice what Wineburg calls “mature historical cognition.” We need to read the Book of Mormon like a historian reads any other historical document, using other source material from the proper time and place to create a context for the book. I should maybe stress that in no case do I claim it is “impossible” for Joseph Smith to have come up with detail x, or idea y. I can never prove that something is impossible for Joseph Smith to think up based on his own cultural background or even out of thin air. Frankly, all bets are off once we start talking about human imagination—it is an incredibly powerful thing. All I can do is compare the text against material from ancient Israel, Arabia, and Mesoamerica, treating it seriously like I would any historical document from those settings, and see what happens. When I do this, I find that it builds faith, accommodates questions, and deepens understanding. The following is a list of the KnoWhys I used for each of these sections. This was the most straightforward “evidences” section of my presentation. Simply put, these KnoWhys contextualize certain Book of Mormon practices and statements with archaeological materials from Israel, Arabia, and Mesoamerica. Illustrating that the Book of Mormon fits within these settings in specific ways gives us reasons to trust that the Book of Mormon is in fact an ancient record. You’ll notice that one of these comes out this coming Thursday. Yep, I gave my YSA ward a little preview. Of course, there are still some questions and puzzles. But that is OK, because real historical documents are not free from confusing details. There are a number of ways to approach questions when we treat the Book of Mormon like a real historical document. I used only one KnoWhy as an illustrative example of this. The same paradigm can be applied to most other archaeology related questions. The bulk of my presentation focused on how reading the Book of Mormon like a real historical record, using material from the right time and place to contextualize and interpret it, helps us better understand its message. These are KnoWhys that use material from Israel, Arabia, and Mesoamerica to deepen understanding of specific events in the Book of Mormon. I closed the presentation with prophetic statements about flooding the earth with the Book of Mormon and using the social media to do so. My purpose in doing so, of course, is because it is simply not enough to a few Saints to change the way they think about the Book of Mormon. To transition from fairytale to history in their reading and interpretation of the text. 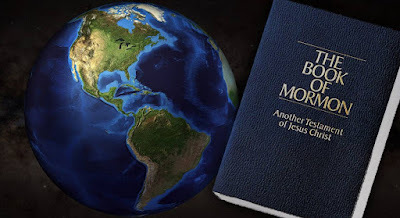 The Book of Mormon has the power to change the world, if we can get the world to change the dismissive assumptions it has been making about the book. The world needs to take this book seriously. But that can only happen if we as Latter-day Saints start taking it seriously. Before we change the world, we must change ourselves.